For a great many of us the Hookah or Shisha pipe is a great way to enjoy our favourite herbal mixture or tobacco product, and whilst the beginnings of this favourite have become lost in time, many believe that it was invented in 16th century mediaeval India. We know of course, that many people of different cultures have relaxed and enjoyed the use of cannabis and more recently tobacco, although the tide seems to be turning away from this long held favourite. Vaping or E-cigarettes are now the fashionable item, but we have now witnessed a new development, which we have seen requested on our web pages in increasing numbers. Some German engineer hookah enthusiasts have hit upon a new invention, which enabled them to overcome, what is now a widely accepted ban on smoking in enclosed premises. These German engineers came up with Shiazo Shish Steam Stones. The idea was quite simple really, most “Eureka” moments are, the natural stones are very small and extremely porous and they injected these with glycerine, together with aromatic fluids which imparts flavour; just in the same way that tobacco or herbal mixtures work. The result is when the stones are heated in the hookah, steam is produced similar to vaping and the result is an intense vapour which can be inhaled and enjoyed. Experts feel that just in the same way as they agree that E-cigarettes are safer than normal cigarettes, Shisha Steam Stones are regarded as a healthier way to enjoy a smoke, even in public buildings, but even so there are some that still do not understand the difference between steam and smoke! 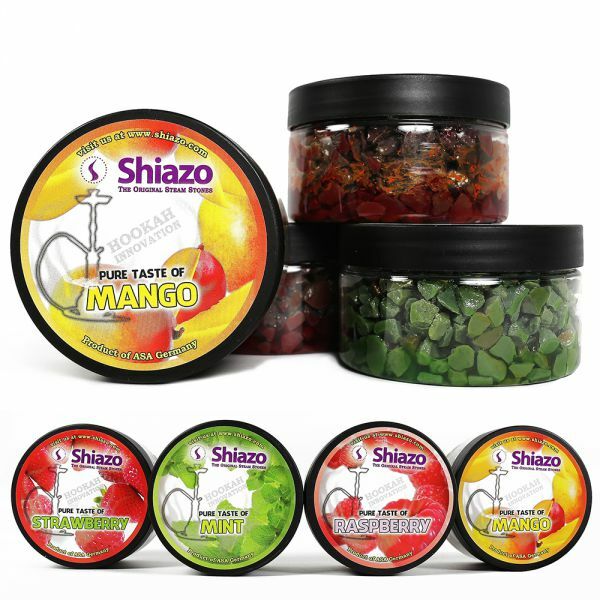 The Shiazo Shisha Steam Stones are now available on offer from us at £7.99 in four pleasant flavours of Mango, Mint, Raspberry or Strawberry. There are many theories about how the shisha pipe, or hookah, as some prefer to call it, originated was it India, Persia or Egypt, there are many claims, but we know it grew in popularity, there is no denying that it has. Any number of examples of traditional hookah can be seen, some made from clay, others from ornately carved metals or plastics, or as in the case of the Mirage 67cm pipe, high quality glass. The Mirage features finely decorated glass in beautiful patterns and the intricate metal work means that his shisha can be just displayed as a decorative item, but it is also a very functional pipe perfect for smoking your favourite tobacco or herbal blend. The Mirage really is a monster and very eye catching; standing 67cm high, equipped with just one hose, but it can be converted to be used by two, so your friends do not have to wait to enjoy the pleasures of the shisha. We are offering the Mirage in a choice of three colours, black, blue or brown/amber, all of which are priced at £42.99 for the single hose version. Everybody loves a traditional shisha or hookah pipe, but many now prefer the safer method of vaping whilst still enjoying the sensation of smoking through a hookah. This is where the great new, Shisha Kingdom Electronic Shisha/Hookah Head comes in and offers a new and safer way to enjoy a smoke. 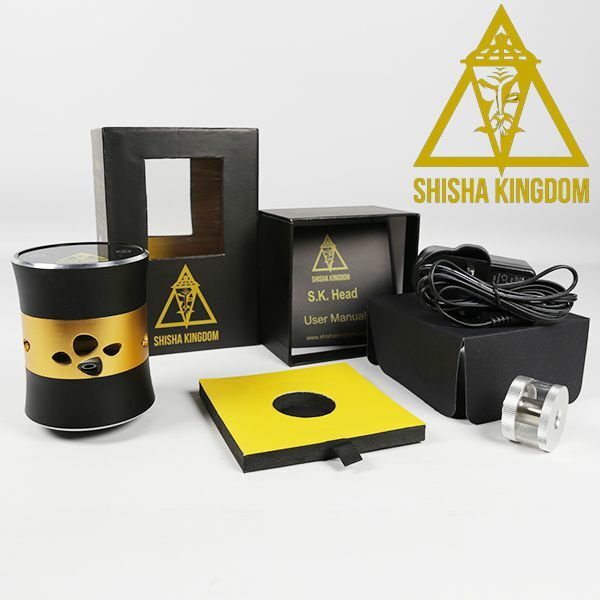 This Shish/Hookah replaces the traditional technique of burning molasses, the Shisha Kingdom Electronic Shisha / Hookah Head’ vaporises E-liquid. Feedback from users tell us that they particularly like the way it smokes just like a traditional Hookah but without the charcoal or fire and because it needs very little preparation, you can get vaping quickly and start enjoying the obvious benefits vaporising has to offer. Well-constructed and made from quality aluminium, but with a stylish decorative shell, the Shisha Kingdom Electronic Shisha / Hookah Head consists of three parts, the display unit, atomizer and base. This electronic shisha/hookah head fits on all shishas/hookahs; works electronically like your e-cigarette and you can you fill it with the preferred nicotine, or nicotine free flavour liquid. Utilising a sleek L.E.D lit touch screen, this revolutionary new product features an adjustable voltage control system that ranges from 3.2V to 6V, enabling you to completely customise your experience to your own liking; just like your e-cigarette. Included with the kit is one UK mains powered charger, rubber grommet and instruction manual and it is all packaged nicely in a smart display box. This Hareem Shisha pipe is the latest addition to our range of these smoking devices and is a great personal pipe that can be enjoyed, by just yourself or with others. 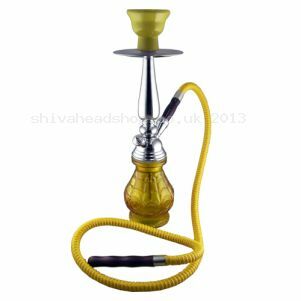 Standing 430mm tall the Hareem Shisha is guaranteed to produce a cool clean smoke and produce clouds of very flavoursome smoke as well. The use of the Shisha came to prominence during the British dominion of India, which lasted from 1858 until independence in 1947. During this time expats used the pipe and it was them that first brought it back to this country. Along with many things that we experience abroad, the popularity never seems to catch on in quite the same way here at home. 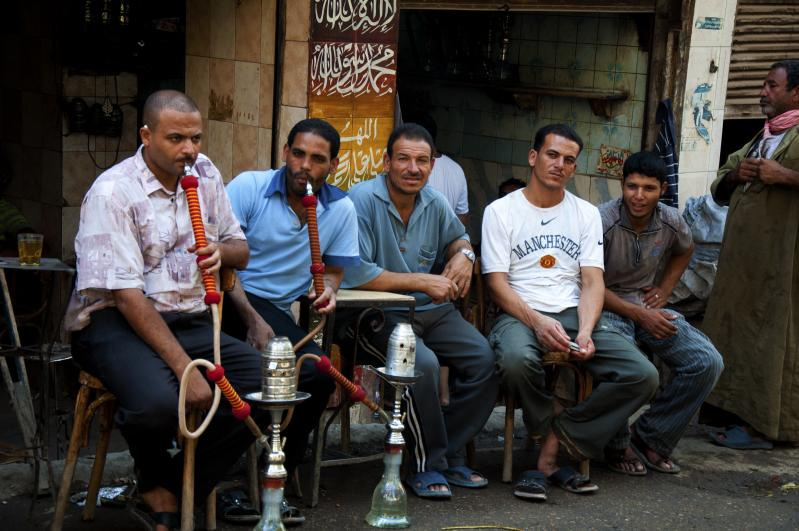 Many other countries have used Shisha pipes and include many Middle Eastern countries where it can be seen in use today outside cafes with groups of men gathered enjoying a social get together. 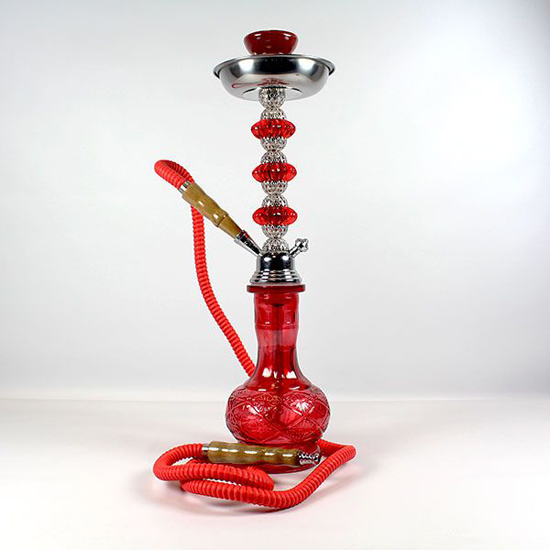 Check out this latest Shisha Pipe at our web pages, this is offered at just £24.99, the colour displayed is an eye catching red, but the colours do vary in accordance with availability. We also display on the same page a number of items which will ensure that the smoking pleasure using the Hareem Shisha Pipe is always is not in any way impaired. The hookah pipe can be traced back to the 16th century and use of it can be traced back to origins in India, It is widely used in the Far East as well as the Middle East and now increasingly in the modern Western World. There are a number of styles of hookah, but the principle is similar in them all, the main advantage is that in all of them as the vapour passes through water and most of the harmful tar is removed. Traditionally the Hookah was made with a glass bowl, but we offer a modern version which is not only a beautiful piece of work, but very sturdy as well; the Range Nile Modern Hookah. 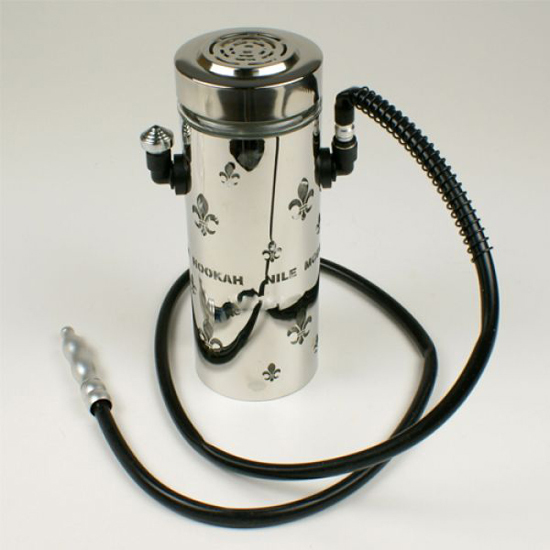 The base is made from stainless steel and so breakages become a thing of the past, that also includes spillages as even if the hookah is shaken there are no spillages, even the charcoal used to filter is enclosed inside a lid at the top and at the base is a clay bowl, and we include with the hookah a 90 cm long hose and carrying bag. To make your smoking even more fun for you and your friends, the Range Nile Modern Hookah includes LED lighting which is sure to make smoking your favourite tobacco or herbal mixture more enjoyable. So all that you need to get started having fun and pleasure is your favourite herbal molasses to smoke in it. With its adjustable voltage you can control just how much vapour you want and the Atomizer holds a large amount of e-liquid for extended personal use, or with friends on 2 or 4 hose hookahs. , The E Hookah Head has a simple touch control screen with LED graphics that allow you to change the Voltage from 3.2 – 6.0 Volts. As well as the voltage display it also displays the Voltage, Puff Counter, and Vaping Timer. A great deal of thought has gone into the design of this Hookah Head as well as the functionality of this device. Take a walk around parts of London; see the people on the frontage of Turkish coffee shops enjoying a hookah together, with the Hookah Head the custom and spectacle can continue but with lesser health risks. Small, but powerful, the Amanoo E Hookah Head is perfect to take with you to your favourite hookah spot. We live in a technological time and everything seems to be getting gadget treatment nowadays and shisha pipes are no exception. Building on the success of the electronic cigarette market, Amanoo has come up with a portable hookah pipe which uses E-liquid instead of burning molasses. The Amanoo Portable Hookah V2 is a healthier way to enjoy your shisha pipe as it vaporises E-liquid, producing a smooth, clean vapour that tastes great. Choose from a variety of off the shelf E-liquid flavours or mix your own custom flavours to your own taste, the possibilities are endless! This portable Hookah pipe has a rechargeable battery meaning it can be taken with you wherever you go and is super easy to set up. Simply fill the atomizer with your favourite E-liquid flavour, screw on the mouthpiece and you’re ready to go. In the box you’ll find the Amanoo Portable Hookah V2, a detachable mouthpiece, 2x atomizer chambers so that you can carry different flavours around with you and a mains charger. There is also a handy USB cable included so you’re never far away from an energy source. The Amanoo Portable Hookah V2 is available now for just £69.99, but if you’re looking to upgrade your old shisha pipe instead of buy a new one Amanoo also make an E Hookah Head which converts traditional shisha pipes into E-liquid shisha pipes. 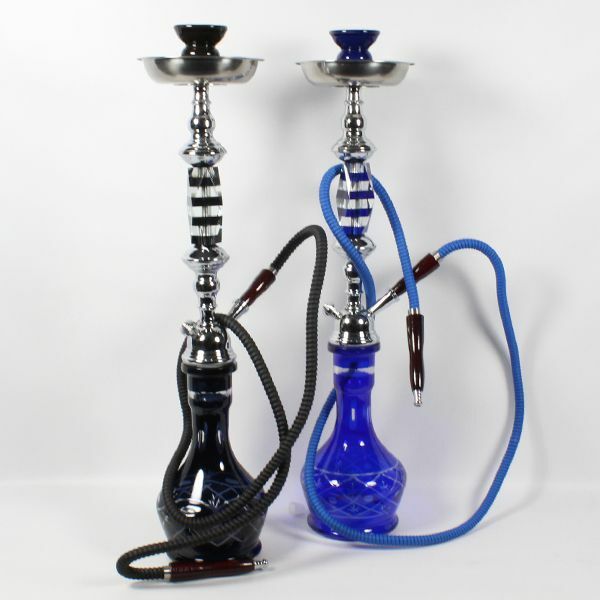 Deep rooted in ancient tradition, the origins of Hookah, Shisha, Narghile or water pipe are widely argued. Born from Middle Eastern history many countries claim to be the ‘father’ of this multi-stemmed instrument. From India to Iran, Turkey to Syria and along to Egypt pinpointing the origin has never been confirmed despite all these countries laying claim. Fill the vase with water making sure you cover the stem. Then in the head, place your flavoured tobaccos, or molasses and cover with tin foil. Prick the foil all over with a needle and place coals on top, but do not cover all the holes you made. Light the coals and wait for them to stop ‘smoking’. Inhale through the hose until smoke bubbles down through the water. 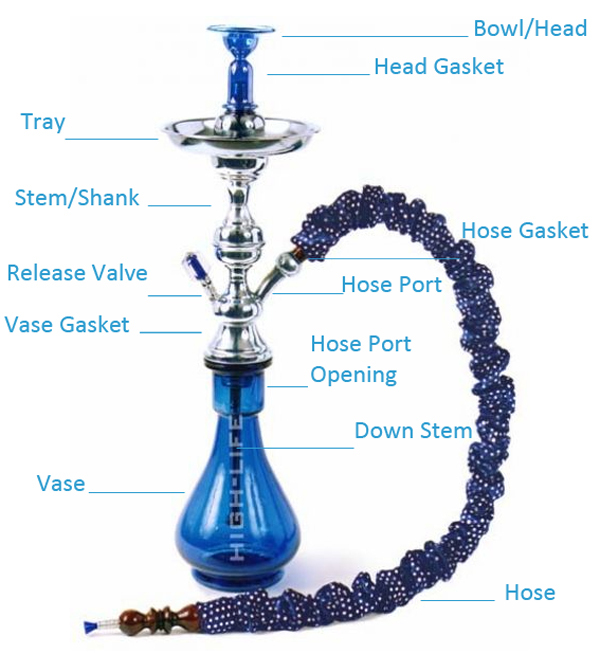 There are many different names for this special water pipe here in the UK they are generally known as Hookah or Shisha Pipes. The British were first exposed to this unusual form of smoking came during the British dominion of India (1858–1947), when expats had their first uses of Shisha pipes. At that time it was a huge part of the culture and was brought back here to the UK. However it never followed the same popularity. The earliest dates of use came from the Middle East popular in Persia, Saudi Arabia, Syria and Turkey. Other early concepts of the Hookah were used in South Asia, India, Pakistan, Bangladesh and Nepal, later spreading to Southeast Asia and South Africa. Many cultures see smoking Shisha Pipes as part of their traditions, enjoyed in social settings with single or double hoses. At get-togethers users hand the pipes around the group after taking a smoke. Across the Middle East you can find many cafes offering Shishas, as many as you would find Starbucks in the USA and pubs in the UK. As prohibition is in place in many of these countries it makes for a nice social gathering. Shishas are not exclusively used for smoking tobacco, there are herbal molasses available which contain no tar, nicotine o tobacco. Other ‘herbs’ can also be used in Shisha’s however in many countries this is illegal, so you’re better off heading to Amsterdam or Colorado to enjoy cannabis in a shisha. What to treat yourself to a taste sensation when using your shisha pipe? Then you need some Al Fakher Molasses. This nicotine and tobacco free molasses is specially formulated for use in shisha pipes and provides full impact flavour with every smoke. Available in eight fantastic flavours including apple, strawberry, peach and orange, Al Fakher Molasses is perfect for just about any smoker. Each pack contains 200 grams of molasses so you’ll always have some at hand. Al Fakher Molasses is available now for £10.99 each or two for £19.99: so what are you waiting for, get your shisha pipe out and start enjoying the taste sensation of Al Fakher Molasses today! For those new to shisha pipe smoking, we stock a wide range of shisha pipes from single hose devices up to multi-hose pipes that are perfect for beginners and connoisseurs alike. The Tropical Shisha Pipe is an ideal accessory for those who want to experience a shisha pipe for the first time or want to add a new pipe to their smoking arsenal. This inexpensive pipe measures approximately 35cms tall and features everything you need to get started straight away. Shisha smoking is a highly social experience, so invite all of your friends around and savour the taste. Here at Shiva Head Shop we have a wide range of herbal molasses which is specially designed for shisha pipes. Choose from a range of flavours including apple, strawberry and mixed fruit. Alternatively you can try out our newest shisha pipe accessories Mountain High Shisha Steam Stones. These small stones provide the same great flavour as molasses but without the nicotine or tar making them the healthier option. The Tropical Shisha Pipe is available now for £19.99; please note that the design and colour may vary slightly from the picture below, but the pipe will be of the same quality.